Goal. 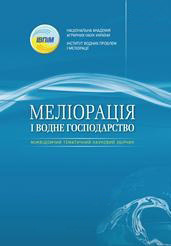 To study and analyze the current state of the irrigation sector in Ukraine and identify the main trends of its development under the conditions of political, financial and economic crisis in the country, imperfection of the existing water management system and insufficient legislation. To ground the scientific basis for restoration and sustainable functioning of irrigation in a changing climate and imperfect water management system. Methods. Analytical, experimental, expert evaluations, method of comparisons and analogues, statistical and correlation analysis. Results. The analysis of world experience shows that today irrigation plays a decisive role in ensuring the sustainability of agriculture against the background of natural warming as a result of significant climate change. According to preliminary expert estimates, about 2/3 of the territory of Ukraine suffers from insufficient natural moisture supply. In Ukraine, 18.7 million hectares of arable land (60%) are engaged in agriculture under the conditions of a significant deficit of water balance that is more than 150 mm, which results in a high water demand for irrigation. The issue of irrigation is especially acute in the Steppe zone, where the deficit of the climatic water balance is 360-480 mm, and the probability of years with a significant deficit of moisture during the vegetation season is 90-95%. In the context of a crisis situation in our country, imperfection of current water management system as well as the existing legislation, actual irrigation areas have been reduced greatly while the level of the usage of irrigation infrastructure available capacity is close to critical. The engineering infrastructure of irrigation systems in most cases is outdated with a service life over 50 years, which ran out of its technical capacity, while some facilities are severely deteriorated when their operation and maintenance are impossible or impractical. The current situation calls for resolving institutional, legislative and managerial issues to help attracting the investments needed to restore the infrastructure of irrigation systems to improve the use of water and land resources in the country and increase the agricultural production. To address these issues, the "Strategy for Irrigation and Drainage in Ukraine for the period until 2030" was developed involving all stakeholders to ensure sustainable, highly efficient and environmentally safe irrigated agriculture in the face of climate change. Conclusions. Implementation of the Strategy is supposed to create the favorable conditions for attracting investments to restore the capacity of irrigation and drainage infrastructure and, as a result, to increase the area of irrigated farmland up to 1.5 - 1.7 million ha, as well as to increase the resilience of the agricultural sector to climate change while increasing the ecological safety of irrigation. 1. Naukovі osnovy ohorony і racіonalnogo vykorystannya zroshuvanyh zemel Ukrayiny /Balyuk S.A. ta іn. Kyyiv: Agrarna nauka, 2009. 624 s.
2. Tehnіko-tehnologіchnі zasady vіdnovlennya zroshennya v Ukrayinі / Romaschenko M. І, ta іn. //Melіoracіya і vodne gospodarstvo. 2006. Vyp. 93. S. 21 – 33. 3. Koncepcіya vіdnovlennya ta rozvytku zroshennya u pіvdennomu regіonі Ukrayiny (za nauk. red. M.І. Romaschenka) K.: CP «Komprynt», 2014. 28 s.
4. Karlos Garsez-Restrepo, Duglas Vermyllyon, Dzhyovanny Munoz. Peredacha upravlenyya yrrygacyonnymy systemamy /Myrovoy opyt y rezultaty. Otchet FAO po vodnym voprosam. Rym: 2007. 63 s.
5. Melіoracіya gruntіv (systematyka, perspektyvy, іnnovacіyi): kolektyvna monografіya. / Balyuk S.A. ta іn. Herson: Grіn D.S., 2015. 668 s.
6. Romashchenko M., Dekhtiar O. Irrigation Reform in Ukraine: Organizational and Legal Aspects/ 2nd World Irrigation Forum (WIF2) “Water management in a changing World: Role of Irrigation in Sustainable Food Production”. 6-12.11 2016. Chiang Mai, Thailand.W.1.3.01. -11r. 7. Svendsen, Mark, Jose Trava. Participatory Irrigation Management: Benefits and Second Generation Problems. Lessons from an International Workshop held at CIAT, Cali, Colombia, 9-15 February 1997. Economic Development Institute of the World Bank, Washington, DC. 8.Comprehsive Assessment of Water Management in Agriculture. Water for Food, Water for Life. Comprehensive Assessmenet of Water Manegment in Agriculture. London: Earthscan, and Colombo: International Water Manegment Institute. 2007. 9. Hrabrin Bachev. Agricultural water management in Bulgaria. Institute of Agricultural Economics, Sofia, 1. August 2010. Onlineat https://mpra.ub.uni-muenchen.de/24535/ MPRA Paper No. 24535, posted 23. August 2010. 10. Renault D and Makin I.W. Modernizing Irrigation Operations:Spatially Differentiated Resource Allocations Research Report 35. International Water Management Institute. P O Box 2075, Colombo, Sri Lanka. 1999. 11. Upravlіnnya procesom vіdnovlennya ta stalogo vykorystannya zroshennya / Romaschenko M. І. ta іn. // Melіoracіya і vodne gospodarstvo. 2014. Vyp. 101. S. 137-147. Romaschenko M. І. ta іn. //Vіsnyk agrarnoyi nauky. 2015. № 10. S. 5-9. 13. Vіdnovlennya funkcіonalnoyi zdatnostі zroshuvalnyh system. Kruchenyuk V.D. ta іn. //Vіsnyk agrarnoyi nauky. 2016.№ 3. S. 49-52.